It was a busy day. I’d sung at least thirty rounds of the “hand-washing song,” created an hour’s worth of child’s flower crowns, and devoured the first Milky Way candy bar (it was cheat day!) that I’d tasted in as long as I can remember. We’d just finished volunteering with friends at the Arts and Literacy Festival in Santa Monica. But this was the moment I was waiting for. I’ve wanted this since college, and I finally mustered the courage upon our latest return to Los Angeles. After two months abroad in Costa Rica and Mexico, we returned to the States with me itching for change. 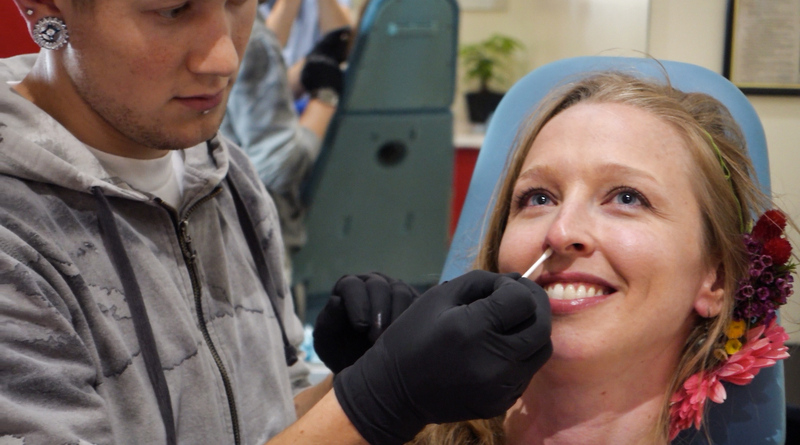 The day after our plane touched down, we hung out with a few of our best LA friends — two of which happened to have nose piercings — and I made my decision. I’d do it the next weekend, and for fun, they’d come too! I hopped up, like a child visiting the dentist, onto the reclined chair that would support me while the needle went through. 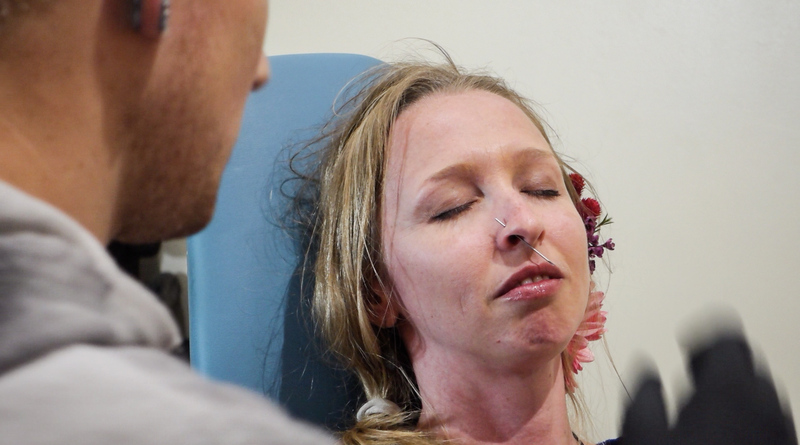 I chuckled as I caught a glimpse of myself in the mirror — flower crown still in place — and leaned back in my seat to listen to an overview of the piercing steps and my only instructions: keep your eyes closed. 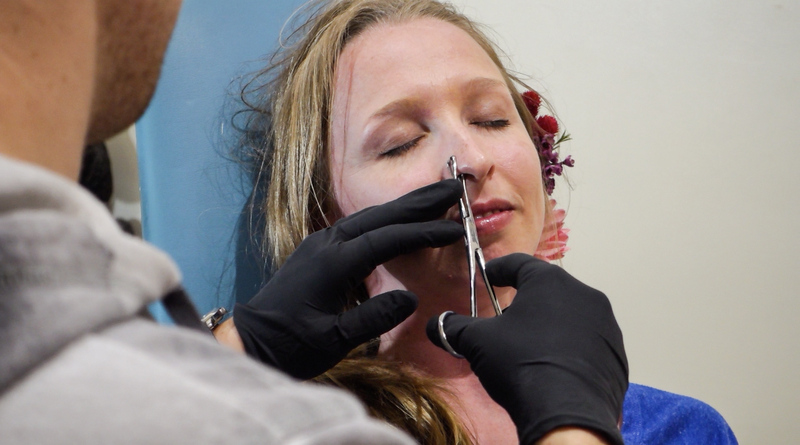 Want to watch the gnarly video of my nose-piercing experience? YEAH ya do! 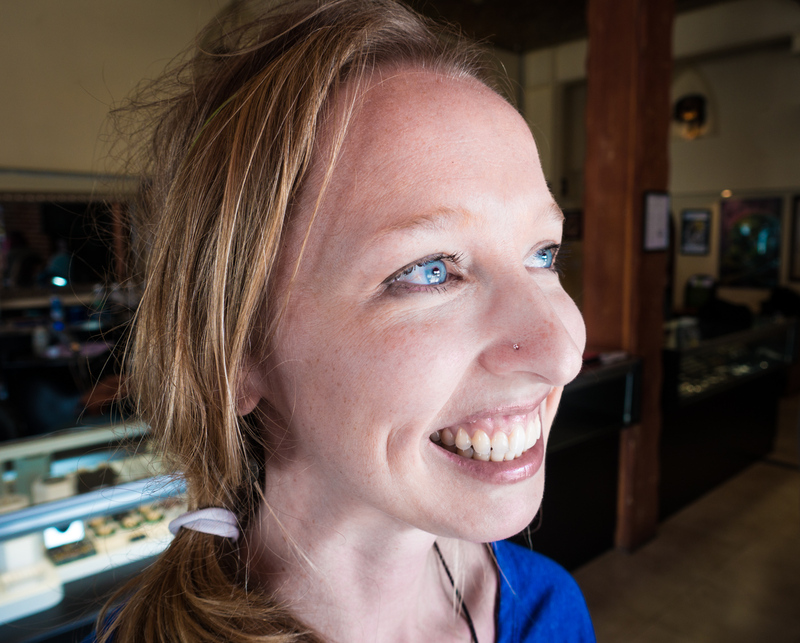 Here’s a little overview of my nose piercing experience, including detailed photos and video from the piercing room. Eyes closed. Deep breath in, “Ow, OW! …okay… not so bad. Now it feels kind of like thread is being pulled through after the needle went through (Nope. that was actually still the needle — the third/fourth photo below. Good thing I kept my eyes closed.) Annnnnnnd okay, we’re done! Open my eyes? A small bucket of tears spill out of my right eye, and I have something new in my peripheral vision. Looks good. Awesome! Phew. I’m done. The length of time it took you to read that is about how long the process took in real life. It still hurts a little, but we’re done! I love it! My nose was sore for about an hour afterward. I had a headache, too — though I think that was from the festival — but even that subsided after a couple hours. It’s just one day afterward and it’s just a little tender to the touch. I have to clean it twice a day for now, and keep it in for four months before I change it, though honestly I’ll probably just stick with this one. 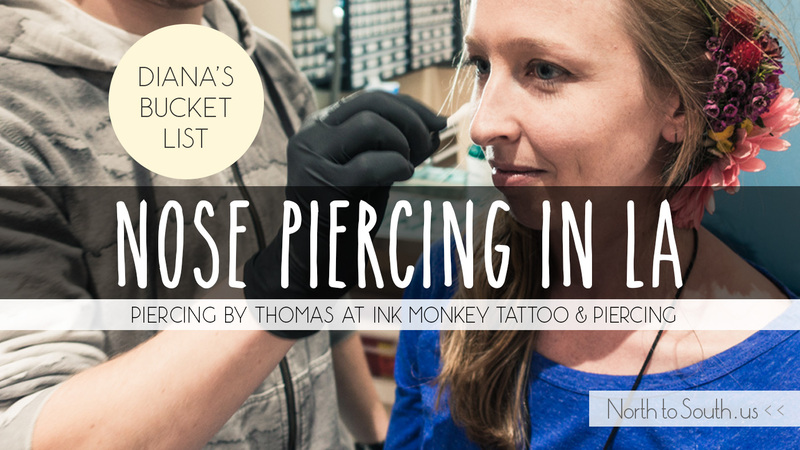 Thomas, my piercer (is that a word? ), was great! I’d recommend him to anyone in LA looking to have this done. That’s it for piercings for me. 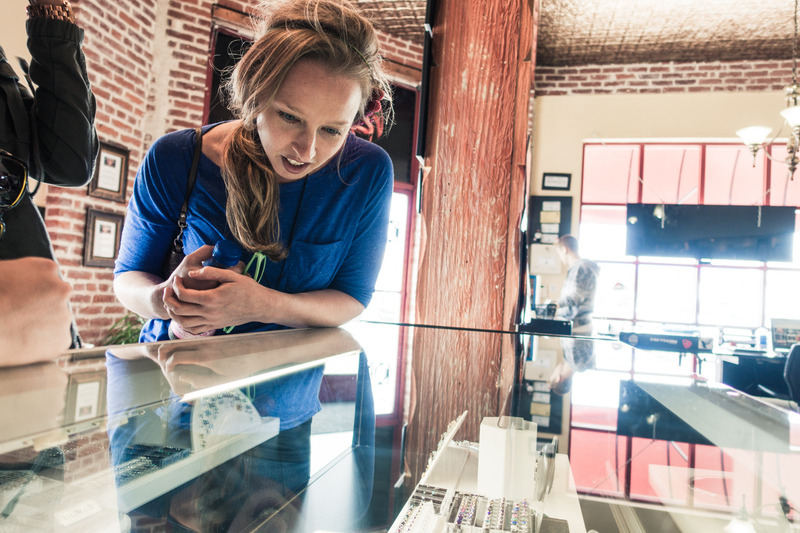 I’ve now got my nose, my belly button, three in one ear, two in the other — though I really only ever wear one set of earrings at a time — and no desire to get any others. Plus I have the satisfaction of completing one more thing from my bucket list! 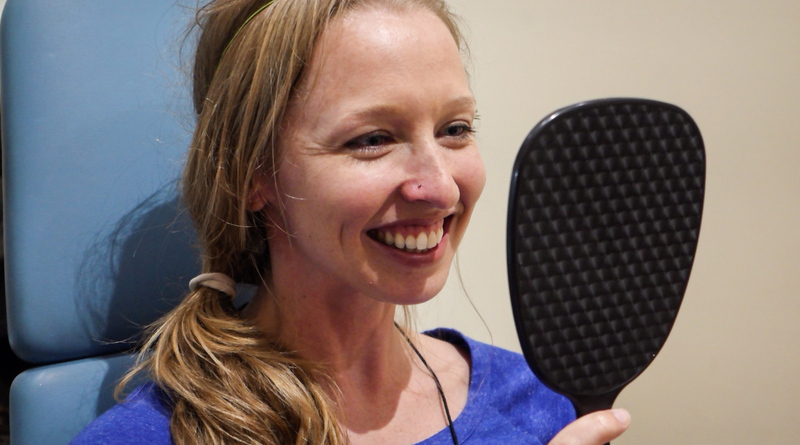 Would you ever get your nose pierced? Are piercings or tattoos on your bucket list? This article was handcrafted especially for you during our travels in the U.S.
Next Article Getting Started on the 4-Hour Body Slow Carb Diet: Weight and Inches Lost in Week One! Awesome! We got our tattoos at Ink Monkey before we left on our trip (and then more tattoos south of the border). A piercing is definitely on my bucket list! Cool! It’s nice to know someone who’s gotten ink there, in case I decide to do it in the future. How long have you had your tattoo from Ink Monkey? Did they do a good job? We got the tattoos about a month before we left, so the middle of September 2013. They did a great job and the tattoos have held up great, especially considering we got them on our feet!